Bogor, Indonesia, 20 Aug 2010: The Borneo Orangutan Survival Foundation (BOSF) announced today that it would, for the first time in 9 years, release rehabilitated captive orangutans back into the wild. The long-awaited release was finally facilitated by the issuance of a special Ministerial Decree by the Indonesian Forestry Minister dated August 18, 2010, which will allow the release of the orangutan into a former timber concession restored into natural forest by PT Orangutan Habitat Restoration Indonesia. The restored forest is located in the East Kutai district of East Kalimantan, Indonesia. PT Orangutan Habitat Restoration is a forest rehabilitation company established by BOSF for the purpose of creating a suitable area to release rehabilitated orangutans currently living in BOSF rehabilitation centers in Kalimantan. The release is the first step toward the release of all captive orangutans in Indonesia by 2015 as directed in December 2007 by the Indonesian government at Nusa Dua Bali. For the past 8 years BOSF has been unable to release rehabilitated orangutans back to the wild due to a lack of suitable habitat for the releases. The Forestry Ministry Decree has now, for the first time, opened the door for BOSF to begin releasing the formerly captive orangutans it has rehabilitated for survival in the wild. The release area was selected because its conditions are near perfect for the survival process for newly released orangutans. It is an 86,450 hectare site in which there is a low density of wild orangutans. 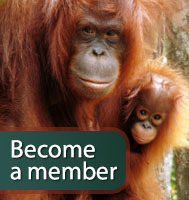 Generally, around 30,000 hectares are required to support 250 orangutans. The topographical conditions in the restored forest area are ideal, with an altitude of 750 meters above sea level and well-stocked with tree species which provide shelter and food for wild orangutans. It is also safe from human threats as the local inhabitants are highly supportive of the release program. At the present time, BOSF has some 838 orangutans in its rehabilitation centers, with 612 in the Central Kalimantan Reintroduction Center in Nyaru Menteng and another 226 in the East Kalimantan Reintroduction Center in Samboja Lestari. The historical release process began during a courtesy call by the Board of Trustees and Board of Directors in April of this year to then forestry minister Zulkifli Hasan, who voiced his full support for the BOSF release program. The August 18 Ministerial Decree is a direct outcome of that visit. Manurung further said that the issuance of the decree did a great service to the BOSF as it will allow the organization to begin to realize its goals. The first priority, he said, was the release of Bornean Orangutans into their natural habitat with the help of local populations. “The government has now started the process of issuing permits for us to take control of suitable land for orangutan release,” said the BOSF Chairman of the Board of Trustees, Professor Bungaran Saragih, a former Minister of Forestry. “We must release all captive orangutans back into the wild. They have for too long been living in cages,” said Professor Saragih. The Borneo Orangutan Survival Foundation is an organization committed to the rescue, rehabilitation and release of orangutans in Central and East Kalimantan. The BOSF has a number of sister organizations around the world supporting its efforts with fund-raising and public awareness. BOSF currently operates two orangutan reintroduction centers—Samboja Lestari in East Kalimantan and Nyaru Menteng in Central Kalimantan. BOSF also operates land rehabilitation program at Samboja Lestari, and program for the rehabilitation of orangutan natural habitat as well as the 369,000 hectare Mawas conservation area in Central Kalimantan, which has an estimated orangutan population of 3,000. The Bogor, West Java-based foundation also operates an eco-tourism lodge at its Samboja, East Kalimantan rehabilitation center.